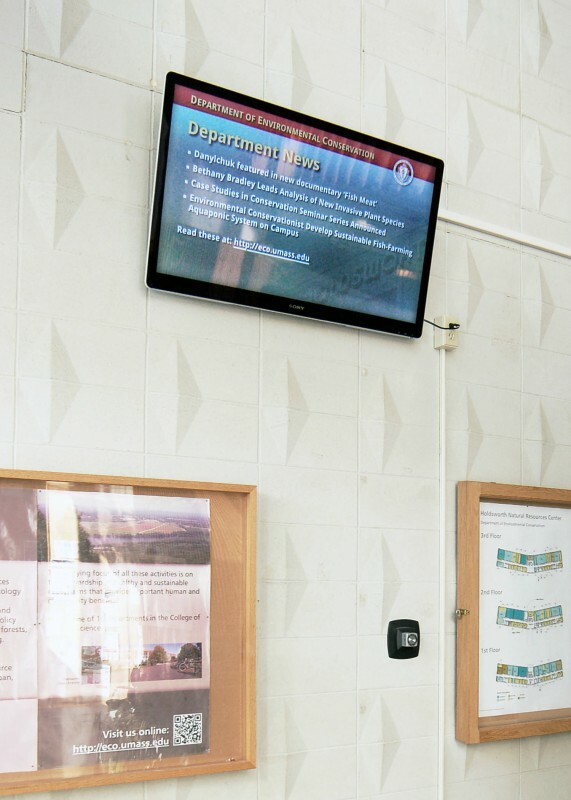 The best way nowadays to set up information displays like these is to have them simply consist of an LCD screen and a Raspberry Pi, with the mini-computer connected to the internet and set to only display a single webpage. This limits any changes and other moving parts to the webpage, which can be easily maintained, even from afar. I started setting these up for our Department of Environmental Conservation in Holdsworth Hall where I actually used an early Google TV, set to display the page on the embedded Chrome browser in fullscreen mode. You can see that display in the image to the right. More recently I set up (with the help of our IT folks in Biology) the building display in the UMass Design Building. This Samsung display uses the latest RasPi and displays the webpage linked below. Interested in using this project? You can find the code now on GitHub here and here.